The Jews of Europe were legally compelled to wear badges or distinguishing garmets (e.g., pointed hats) at least as far back as the 13th century. This practice continued throughout the Middle Ages and Renaissnace, but was largely phased out during the 17th and 18th centuries. With the coming of the French Revolution and the emancipation of western European Jews throughout the 19th century, the wearing of Jewish badges was abolished in Western Europe. The Nazis resurrected this practice as part of their persecutions during the Holocaust. Reinhard Heydrich, chief of the Reich Main Security Office, first recommended that Jews should wear identifying badges following the Kristallnacht pogrom of November 9 and 10, 1938. Shortly after the invasion of Poland in September 1939, local German authorities began introducing mandatory wearing of badges. By the end of 1939, all Jews in the newly-acquired Polish territories were required to wear badges. Upon invading the Soviet Union in June 1941, the Germans again applied this requirement to newly-conquered lands. Throughout the rest of 1941 and 1942, Germany, its satellite states and western occupied territories adopted regulations stipulating that Jews wear identifying badges. Only in Denmark, where King Christian X is said to have threatened to wear the badge himself if it were imposed on his country’s Jewish population, were the Germans unable to impose such a regulation. 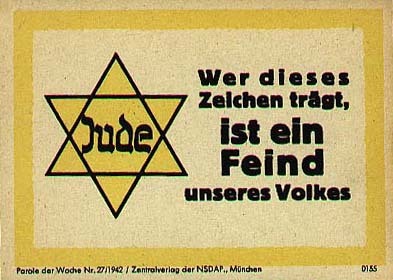 Nazi propaganda leaflet: “Whoever bears this sign is an enemy of our people”. The design of the badge varied from region to region. Below, find examples of badges worn in different European countries under Nazi rule. 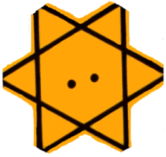 A yellow Star of David outlined with Black with the French word for "Jew" written in Hebraic style. 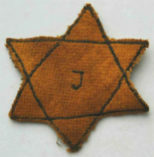 A yellow Star of David outlined with black with a Hebraic styled "J", and abbreviation for "Jew". A yellow Star of David outlined with black with the Dutch words for "Jew" written in Hebraic style. 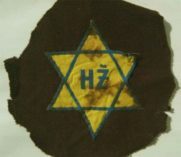 A yellow Star of David outlined in black with the German word for "Jew" written in Hebraic style. 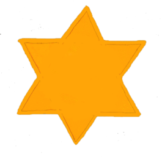 A gold Star of David outlined with blue with an abbreviation of the Slovakian word for "Jew". A gold Star of David outlined with blue. 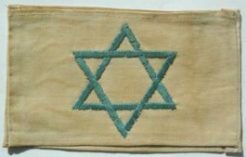 Blue Star of David on a white armband. 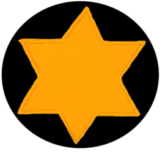 A gold Star of David outlined with a black and yellow button. A yellow Star of David on a circular black background. Yellow armband with black "Z", an abbreviations for the Serbo-Croatian word for "Jew". Encyclopaedia Judaica, 2nd Edition. Edited by Fred Skolnik and Michael Berenbaum. Detroit: Thomson Gale, 2009. Encyclopedia of the Holocaust. Edited by Israel Gutman. Jerusalem: Yad Vashem, 1990.